Tim Koch goes in for the Schuylkill. The current partial shutdown of the U.S. Government does not seem to have affected the website of the Library of Congress. Along with other partners, the Library runs the online ‘World Digital Library’, a site which ‘brings together on a single website rare and unique documents – books, journals, manuscripts, maps, prints and photographs, films, and sound recordings – that tell the story of the world’s cultures’. HTBS Types will not be surprised to learn that I put ‘rowing’ into the site search. 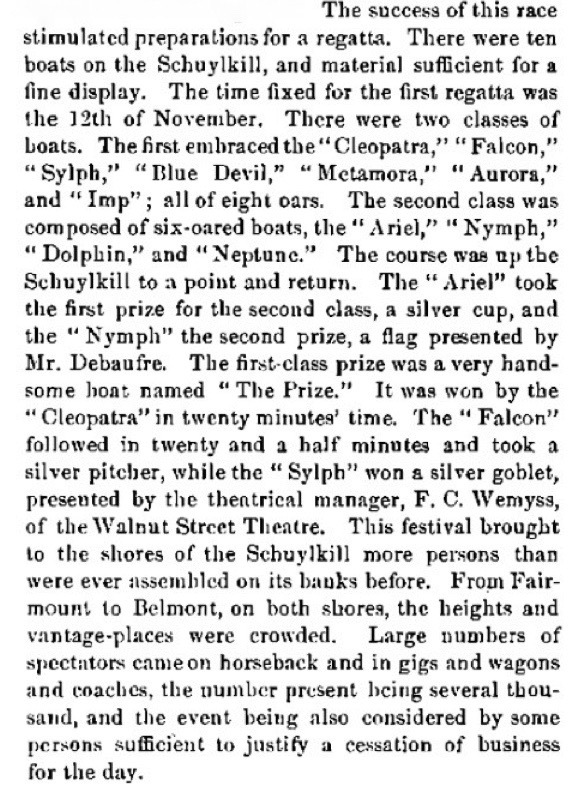 The result was some historic images of boat racing in Philadelphia, perhaps the earliest home of American competitive rowing after New York. The actual depictions of boats are small, but they are still significant, showing that while young British gentlemen from Eton, Oxford and Cambridge were busy establishing rowing as an amateur sport, their American cousins were doing much the same thing. Before moving to these, I have posted a very brief history of rowing in Philadelphia. The city is sited on the Delaware River, though most rowing takes place on the Schuylkill River (pronounced Skool-kil), which flows into the Delaware. Philadelphia in 1908. The Delaware is in the foreground, the Schuylkill is in the middle ground. 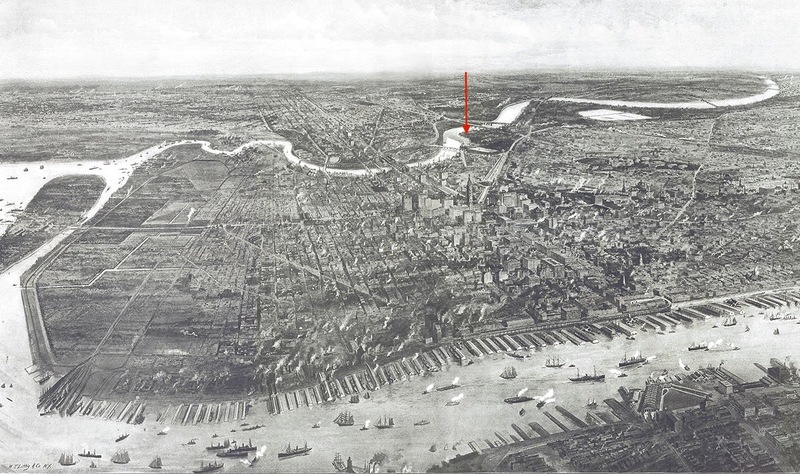 ‘Boathouse Row’ is marked by the red arrow. 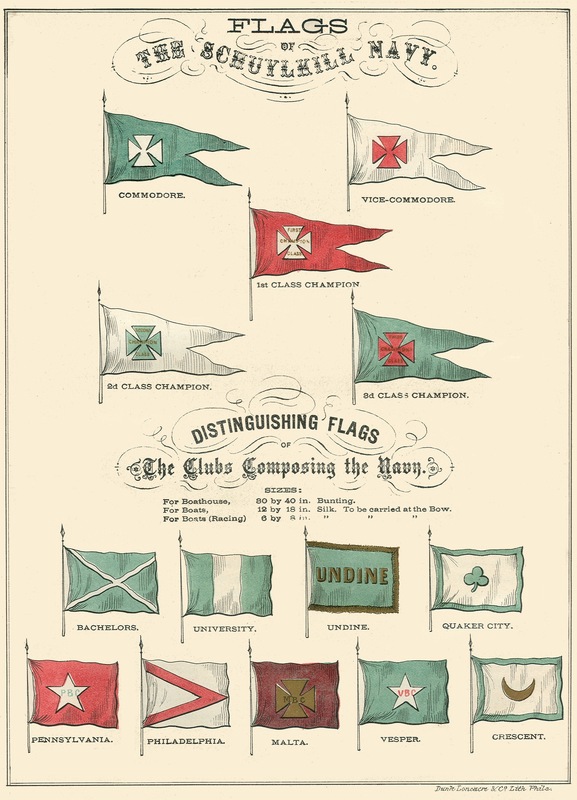 Scharf’s “History of Philadelphia” (1884) notes that boat clubs were established ‘around 1833’. However, it seems strange that it took two years before they raced each other. 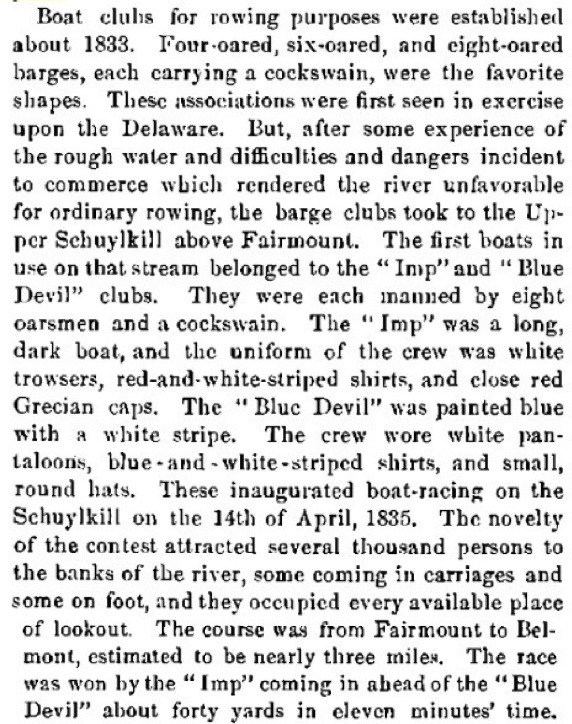 Scharf holds that the success of the race between the ‘Imp’ and the ‘Blue Devil’ in 1835 resulted in the organisation of a regatta between seven eight-oared and four six-oared boats. 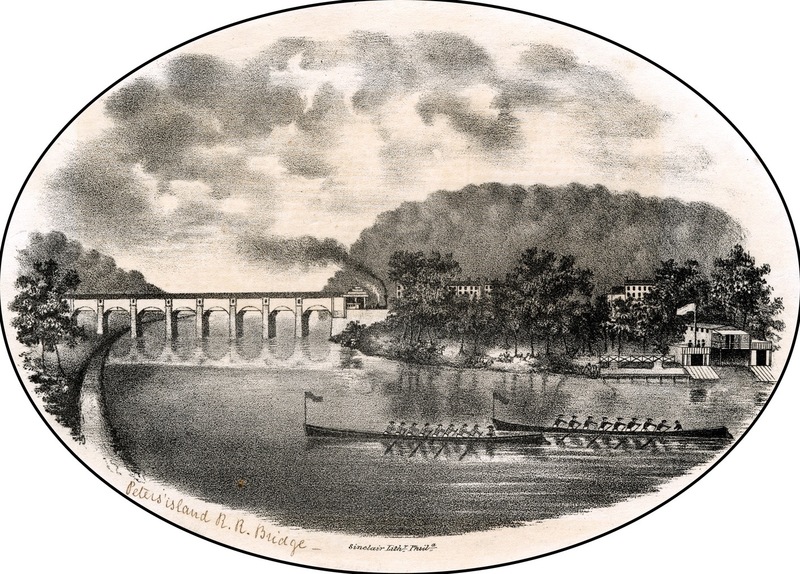 Rowing in Philadelphia probably began in earnest after 1821 with the construction of the Fairmount Dam next to the Fairmount Water Works of 1815. 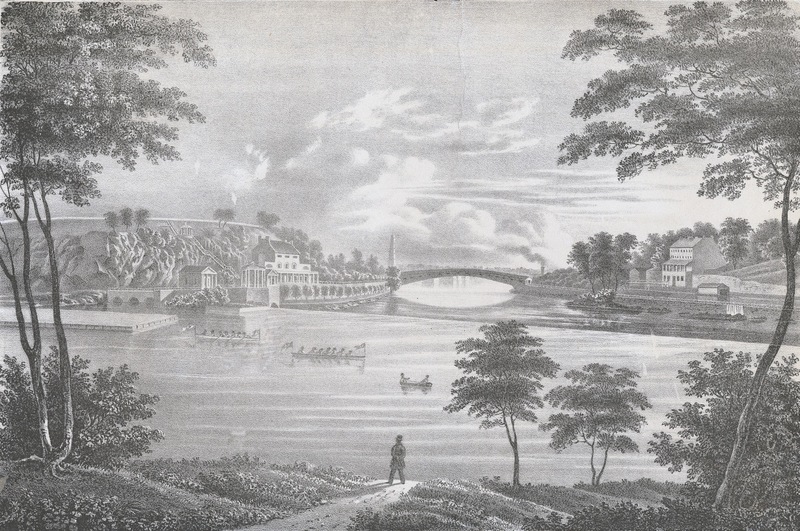 This and later developments transformed a stretch of the Schuylkill from a tidal river into a slack water river resembling a very long freshwater lake. The placid stretch was ideal for ice skating in winter and rowing in summer. Unfortunately (or not), the calm water provided a breeding ground for mosquitoes. This drove wealthy residents from their riverside mansions and these abandoned estates were bought by the City of Philadelphia. In 1844, the leaseholder of one of these opened a beer garden and allowed local rowing clubs to build boathouses on the estate’s land bordering the Schuylkill. Thus, Philadelphia’s famous Boathouse Row was born. 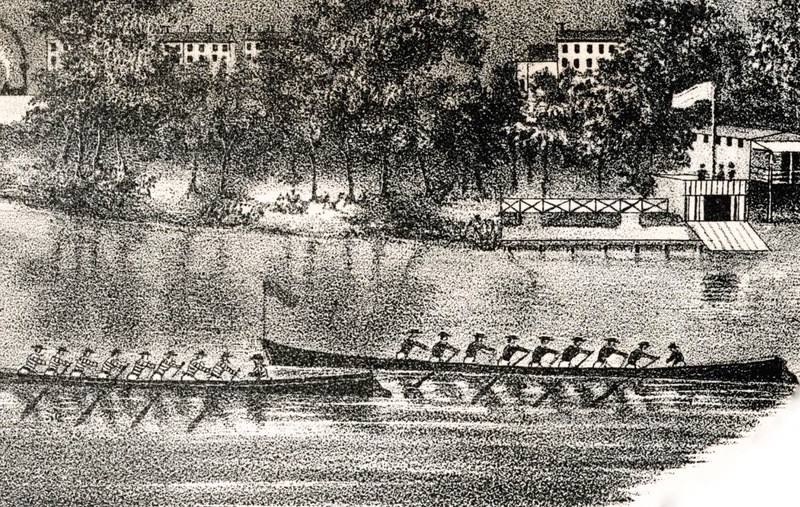 In 1856, the clubs along the row formed the Schuylkill Navy in order to regulate boat racing, making it the oldest existing amateur athletic governing body in the United States (the first boating association in the U.S. was established in New York in 1834, this being the short-lived and strictly amateur Castle Garden Amateur Boat Club Association). 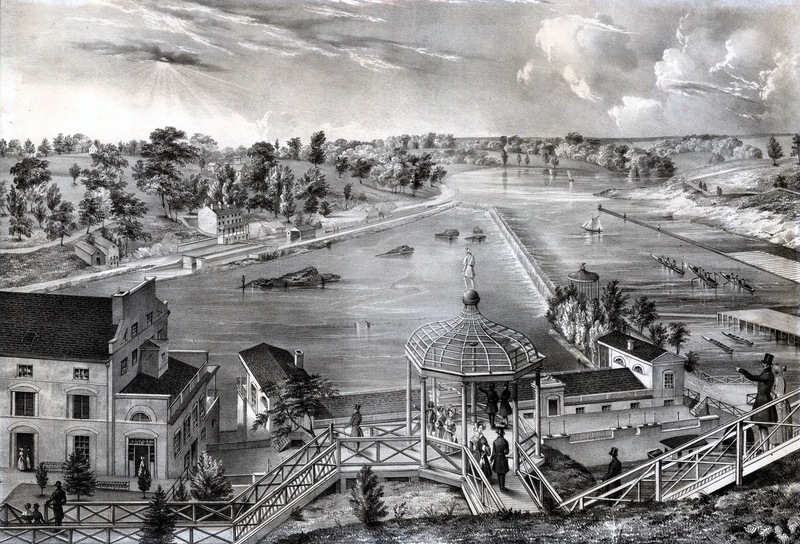 The Fairmount Waterworks on the Schuylkill, one of America’s earliest municipal water-treatment systems, pictured in 1838. The works combined innovative engineering and beautiful buildings in the Greek Revival style, making it a tourist attraction and a centre of leisure from the beginning. Two coxed sixes appear to be racing each other. Picture: The Library of Congress/The Library Company of Philadelphia. 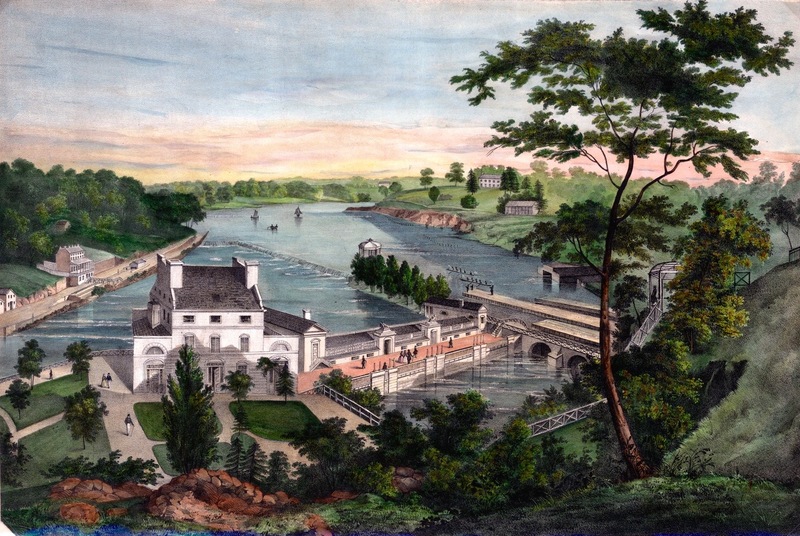 An 1838 view of the Fairmount Water Works including the engine house and mound dam. Two coxed fours race near the pontoons adjacent to the waterworks. The land on the right is the site of the present Boathouse Row. Picture: The Library of Congress/The Library Company of Philadelphia. A similar view to the above, also dated 1838. In this picture, three coxed pairs race each other. Picture: The Library of Congress/The Library Company of Philadelphia. Two eights on the Schuylkill, upstream of Fairmount. The bridge is the Columbia Railroad Bridge of 1834. This print was used as a sheet music cover for ‘Schuylkill Boat Song’ which was published around 1842. Picture: The Library of Congress/The Library Company of Philadelphia. 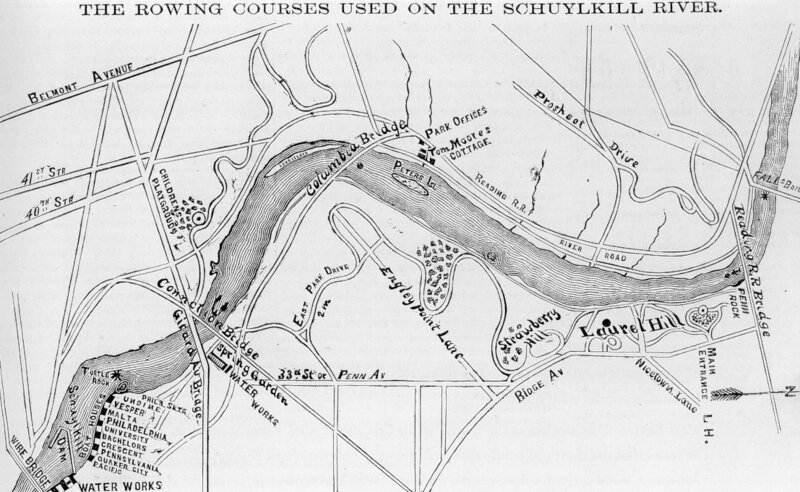 An 1872 map of the Schuylkill rowing course. Picture: Wikipedia. 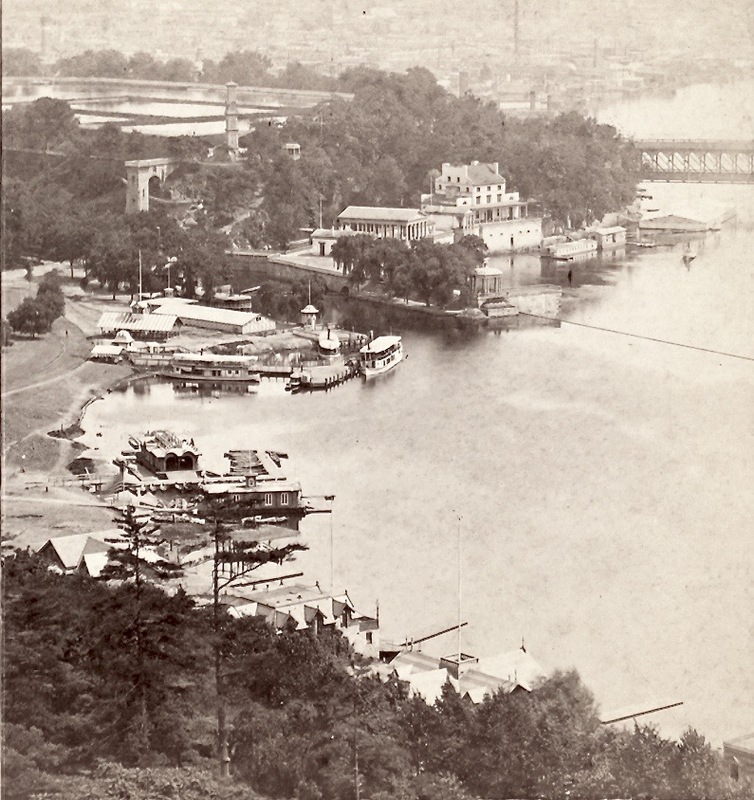 A photograph of c.1872 showing Boathouse Row in the foreground and the waterworks and dam in the middle ground. Picture: Wikipedia/Public Domain. Boathouse Row on the Schuylkill today. Picture: Visit Philadelphia. A nice high-resolution panorama of the row is here (click to enlarge and then scroll left to right). 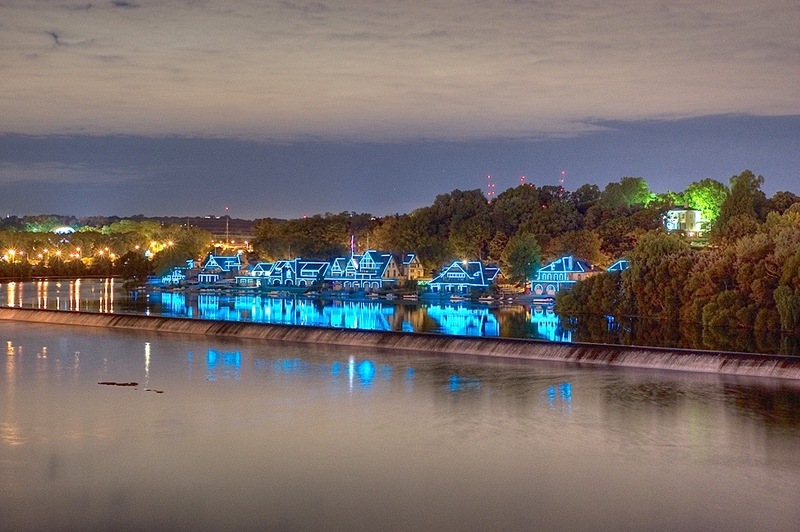 Another modern view of Boathouse Row plus the Fairmount Water Works Dam. Picture: Wikipedia/Emy111. 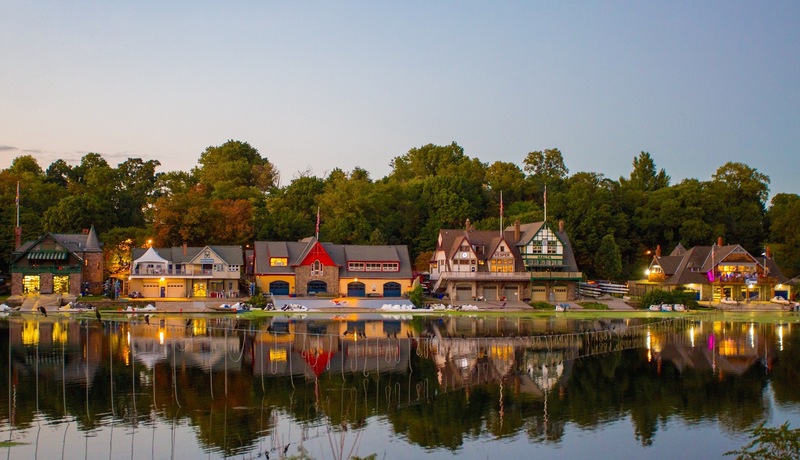 In 1987, Boathouse Row was listed on the U.S. National Register of Historic Places. 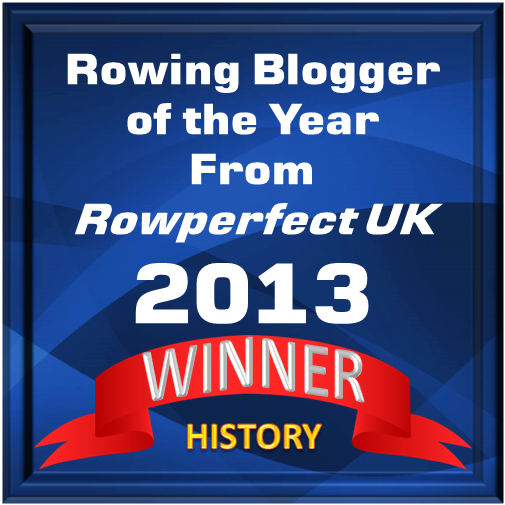 Who would have guessed that it was mosquitoes that were responsible for this significant piece of rowing history?